AllegroMedical.com offers TheDiscovery 10 Back Brace . The benefits of the Discovery 7, 8 and 9 all in one brace! Convertible design allows the DS-10 to be offered as a fullback or low profile brace. Pulley system & pull tabs make it easy to achieve optimal compression for most effective pain relief even for arthritic/geriatric patients. 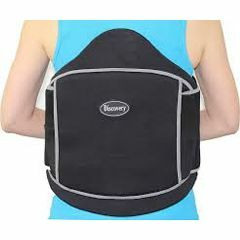 Features a split anterior panel, which allows the front panel of the brace to line up perfectly on the patient’s abdomen.